Over the past thirty years China has performed a herculean task of transitioning its country of 1 billion people from an agrarian economy to an industrial economy. The world has gone so far as to label this transition a “miracle”, because no one has ever seen such a thing in his or her life time. This isn’t even a once in a generation or life time transition, this is never seen before in history. Let that sink in a bit because it can be difficult to fully grasp the scale of what China has accomplished over these past 30+ years. Probably the most amazing thing about this transition is that China hasn’t even paid for it. That’s right, the most magnificent economic transition in recorded history has not been paid for… yet. Instead of paying down its debts, China has continued to build and build both its debt and its infrastructure. In just over a decade, China has QUINTUPLED (5x) its banking assets to a ridiculous $26 trillion or twice as large as US banking assets. As China continues to crash the whole world will feel its wrath. But not all countries will feel the effects equally or at the same time. As timing is everything it is very important to short the countries that will be hurt from China’s fall first and then use the profits from those plays to short the other nations as the domino effect plays itself out. Countries first affected by China’s collapse will be the ones that have benefited the most from its rise. These are resource heavy economies such as Brazil, Australia and Canada. These countries have been pumping out resources and increasing capacity to meet China’s ever growing demand. But as China has slowed down, the world has seen a supply glut of resources and no demand to meet it. As a result the commodity super cycle which peaked in 2012 is starting to crush these heavy exporting nations. Brazil which has just recently entered a recession has been the first to fall, but there exists other nations close behind that have still managed to stay afloat. But in my mind these countries, their banks their corporations and their currencies are starting to feel the drag of China and will very soon join Brazil. I’ve mentioned Australia before, and I’ll mention it again because I think it is at the top of the list of countries that will take a hit as China crashes. Australia’s largest export partner is China. It has the 2nd highest household debt in the world. It has a property bubble and it too has suffered from terrible government guidance. So not only is Australia dependent on China, it too is extremely over levered! To show you how royally screwed Australia is, this is a chart from 2012. Here we see the ridiculous projections the government made. 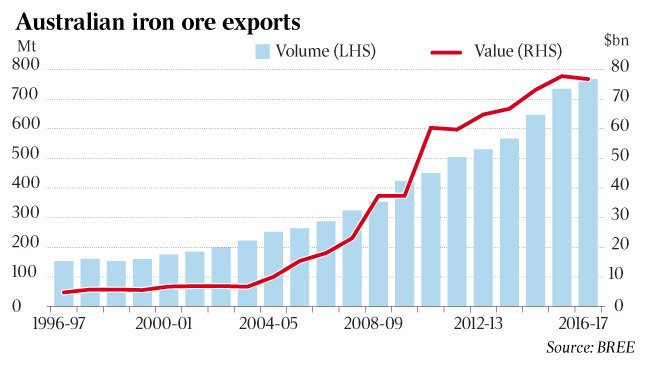 They predicted Iron Ore to rise 50% in the years following 2012. Instead Iron Ore, as I PREDICTED back in 2013, in my very first post, plummeted. It’s current value at $52/Mt is only 8% of what the Australian Government predicted it would be. Let’s give another round of applause to government forecasters, for with their logic all things are truly possible! On the back of those predictions, Australian mining companies greatly weakened their positions as they acquired useless capacity for artificial demand. As china crumbles under the weight of its massive debt build up, Australian mining companies will be left in the dust to reap the impending whirlwind. Back to the Australian banks which have offered some the largest dividends in the developed world. This has attracted lots of capital and increased their share price. But the flip side is that the people who invested in these banks, only put money in them because of the returns they’d be getting on their equity. Now the share prices are falling, these investors will start to get a little weak in the knees and head for the exit. But the share price hasn’t fallen that much, as Australian banks on a Price to Book value are more than 150% over valued compared to their American counterparts! You add all this up and Australian banks look to be a great one sided bet!